Likud leader, the outgoing prime minister Binyamin Netanyahu, has won a fourth term after a last-ditch electioneering blitz. As votes of the March 17 election were counted Tuesday night, Likud’s winning margin over its rival, the Zionist Union led by Yitzhak Herzog, widened from one seat to seven. With 99 percent of the count, Likud broke away from their early deadlock to 29 seats (of the 120-member Knesset) while the Zionist Union dropped to 24 (24 to 19pc). These figures turned the tables on the polls, which consistenly predicted a Herzog win, and boosted Netanyahu’s leverage for swiftly negotiating a new coalition with smaller partners. Their bargaining power was reduced by their own disappointing results: The former Likud minister Moshe Kahlon, whose new Kulani party challenged Netanyahu on the social ticket, come out with 9 seats; Yair Lapid’s Future dropped form 19 to 11; Avigdor Lieberman’s Yisrael Beitenu to 8; and Naftali Bennett’s Habayit Hayehudi plunged to 7. The ultra-religious Shas party will most likely end up with 8 seats after Ellie Yishay’s breakaway Yahad failed to cross the threshold to election. The far-left Meretz survived with 4-5 seats. The Joint Arab List stands provisionally at 14 seats. The turnout was 71.8 percent, 4.1 percent higher than the last election. Final results are expected some time Wednesday after the ballots are counted manually. Netanyahu has phoned right-wing Bennett and former Likud minister Kachlon, whose party ran for election for the first time on a social ticket, to discuss their joining his new government. debkafile reported Monday night: In the final hours before Israel’s fiercely contested general election, the four-seat margin the polls had awarded Yitzhak Herzog’s opposition left-of-center Zionist Union against Binyamin Netanyahu’s right-of-center Likud was shrinking fast. debkafile’s sources, which tapped into some of the inside estimates, found these two frontrunners frantically crunching numbers in a race that might well turn out to be too close to call. Whaever happens, neither of the two biggest parties can expect to form a government without coalition partners. According to last-minute estimates, the Zionist Union expected 26 (out of 120) Knesset seats compared with Likud’s 23, while Likud confirmed its rival’s 26 seats, but awarded itself 24. The gap had closed from four to two seats between them. 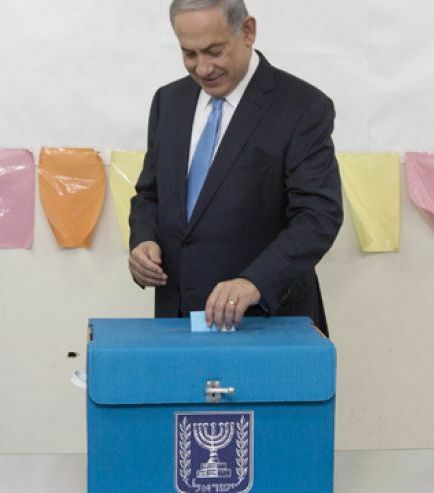 Barring surprise upsets – to which Israeli elections are often prone – the figures had enhanced the Likud leader’s chances of forming the next government compared with Herzog. The latter would have to depend on Yair Lapid’s centrist Future party, a partnership that would automatically cut the religious parties out of the equation. Herzog in recent days fought against this calculus with an intense last-ditch effort to peel voters away from Future so as to leave open the alternative option of inviting two or three of the religious factions to eke out his administration. The second hurdle in Herzog’s path to the prime minister’s office was the falling fortunes of the far-left Meretz, headed by Zahava Galon, which faces the danger of not making it past the new threshold limit. This would leave the Zionist Union bereft of its safest partner. It was this potential setback which brought the Zionist Union’s co-leader Tzipi Livni rushing into the breach. The deal for the merger of her party with the Zionist Union entailed a promise to rotate the premiership between Herzog and herself – two years each – if the party was able to form a government. In the past week, Zionist Union strategists estimated that this deal would cost the party valuable votes. Ceding her turn at the premiership on behald of the party of which she is co-leader, would be worth another two or three Knesset seats – enough for a game-changer. Netanyahu is saddled with his own problems. Two factions which he counted on to eke out his coalition, Avigdor Lieberman’s Yisrael Beitenu and Ellie Yishai’s Yahad (breakaway from the ultra-religious Shas), may like Mertz fall at the threshold barrier. Livni’s eve-of-election gesture made it easier for Herzog either to form a cabinet or more likely join Netanyahu in a unity government with Likud, an option that would depend on the way the electorate votes Tuesday. Balloting stations open at 7 am Tuesday. The first exit polls are promised seconds after 2200.